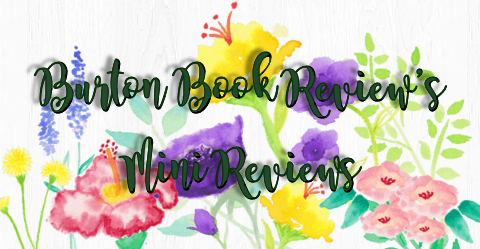 Read my Review of My Unfair Lady. See below for giveaway details of this new title by Kathryne Kennedy. Thank you so much for having me as your guest, Marie. 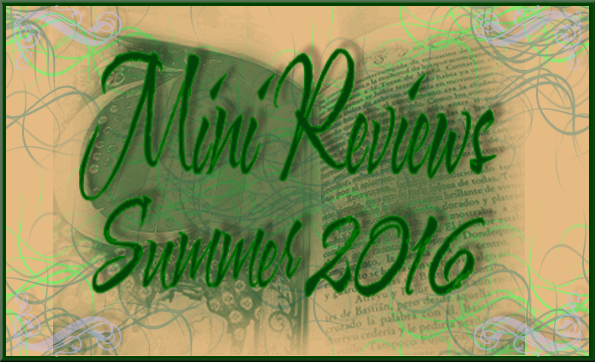 As a lover of historicals, your blog is a treasure for me. I want to discuss why I write historicals as opposed to another genre, and the answer is, of course, because I love history and all the pomp and beauty and sometimes downright wickedness of history. Medieval, Tudor, Victorian or Georgian, there’s something both elegant and mysterious about every era that draws me in. 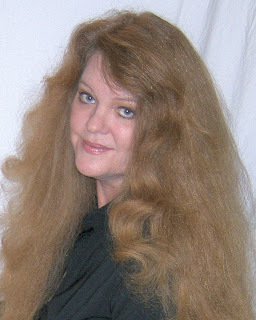 Although my books are primarily romances and therefore much of the research I do doesn’t wind up in my books, I still have to really have a sense and a feel for the era. When I start researching I’m often drawn to new topics, and have to force myself to stick with the subject that I need an answer to, or I’d never finish my next book. And some of the information I find may be historically accurate, but if my readers aren’t familiar with the concept, or that particular development in technology, I don’t use it, although I do try to be as accurate as possible. There’s also a certain style when writing historicals that I adhere to. Whenever I run across a word that seems too modern, I check it as often as possible. I admire historians because there’s so much conflicting information, even from one reference book to another. I often have to choose which fact seems more likely. In many instances it’s a matter of not enough information surviving for a historian to make a judgment on, and they’re forced to come up with the best theory. And it seems like the more research I do, the more I realize I don’t know. There’s a particular research book I used for my upcoming Victorian romance, My Unfair Lady, that I think the readers of this blog might enjoy. Filled with gorgeous photos, it presents factual information in a lively and entertaining manner. It’s titled, To Marry an English Lord, by Gail MacColl and Carol McD. Wallace. Although I’m currently writing a new fantasy series set in Georgian England, My Unfair Lady, takes place in the Victorian era. Inspired by Shaw’s Pygmalion, I wrote it in the same era, even though it’s an entirely different sort of story. The system of nobility makes for an even wider gulf between my hero and heroine. I set the story late in the Victorian era, when Mrs. Astor ruled New York society, and climbing the social ranks for the newly rich was near impossible. Not to be outdone, brave mama’s sent their daughters to London to marry a title, and England welcomed the new wealth they brought with them with open arms….except for the English ladies who found their marriage prospects rapidly reducing, and others like my hero, who abhorred the idea of purchasing titles. In historicals you can have the uncertainty of an arranged marriage. Gentlemen were, for the most part, bound by morals and codes of conduct, a perfect recipe for dashing heroes. Ladies were raised to a certain standard of behavior, and women who rebelled or stepped out of this concept of what a woman should be make for an unusual heroine. Historicals provide the best setting for a Cinderella story (one of my favorite themes) where a poor woman can rise to the ranks of the rich. Or where, as in My Unfair Lady, a brash American woman can rise to the status of a lady. And where else do you have such a plethora of nobility who make pleasure an art form? The balls, the fetes, the dinner parties. The elaborate clothing of silk and satin and gowns that transformed you into a princess. Tea and silver and crumpets and doilies. The horse races and garden parties and seaside resorts. Mansions glittering with gilt, marble floors, paintings of master artists, and sweeping staircases. There’s so such romance and elegance to the historical era that makes for great fantasy. And when you’re writing what you love, and researching what fascinates you, it doesn’t feel like work. So, why do you love reading historicals? I’ll be checking in all day for your comments, and look forward to your answers. 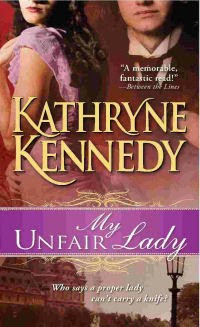 My Unfair Lady by Kathryne Kennedy—in stores December 2009! 1. Follow this blog publicly via google friend connect. 2. Comment with your E-mail Address. 3. 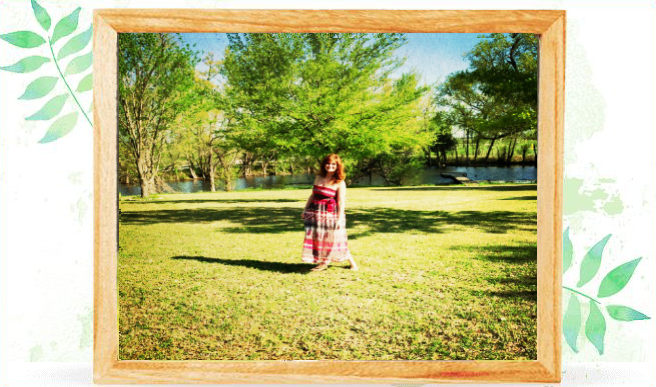 1 extra entry each for a Twitter, Blog Post or Sidebar Graphic Link, or Facebook Share, please provide links. 4. 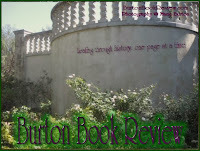 For an extra bonus +2 entries, read and comment on my review post at this link, come back here & comment that you did so. Thanks for entering, and I wish you luck!